Greetings Eventers! Or should I say Earthlings??? Naaaa, I'm still not buying aliens yet, I don't care what any of you say! Too obvious, too cliche'. They're going somewhere else with this. But visitors, extra-terrestrials or not, I am thoroughly still enjoying The Event! Do I think LOST and 24 had a baby and its child is The Event? Well, no NBC, no I don't. But that doesn't mean the show isn't good! And if we're crossbreeding shows, I would think we would need to throw Battlestar Galactica into the mix now. Anyway, we are 2 hours in and there have been some twists and turns already. Some predictable, others not so much. But what they are setting up is ALL good for the foreseeable future. A nice thrill ride of a show with a dash of mystery! And now, my friends, let's RECAP! In another flashback scene with the boring bureaucrats, we have a meeting with the VP, Pres, CIA Director Sterling. Sterling asks one more time that the President stops looking into the Inostranka-ites. But the No-Nonsense Commander-in-Chief tells him to ZIP IT! So here is our big informational download about THE OTHERS...errr those special people that are being detained in an Alaska facility! As some may have seen in the glimpse of a file in last week's episode, these detainees have been detained since 1944 (during WWII). They were in a aircraft on undeclared origin that crashed and the military swooped in very quickly to the scene. We learn that these people are not of "terrestrial" origin. Their blood is different. They age much slower. But their DNA varies slightly less than 1% from humans. Sterling makes a comparison to Chimpanzees which are only 2% different than humans. This stating that it is drastically different. Okay, so let me throw my hat into the ring here. Everyone wants to cry ALIENS! "Not Terrestrial!" ALIENS!! I just don't want to buy it. It's not like they came out and actually said aliens, now did they? There are many shows lately that have dealt with aliens. BSG, V, 4400. I just don't think it would be that obvious. I like some people from last week's recap throwing around the idea that maybe these are folks from the FUTURE. So maybe they are human, just an advanced version of humans. After all, did we evolve from the ape? So why are they being held? According to Sterling they are being held because they refuse to tell the truth of who they are, why they are here and what they really want. All good questions! 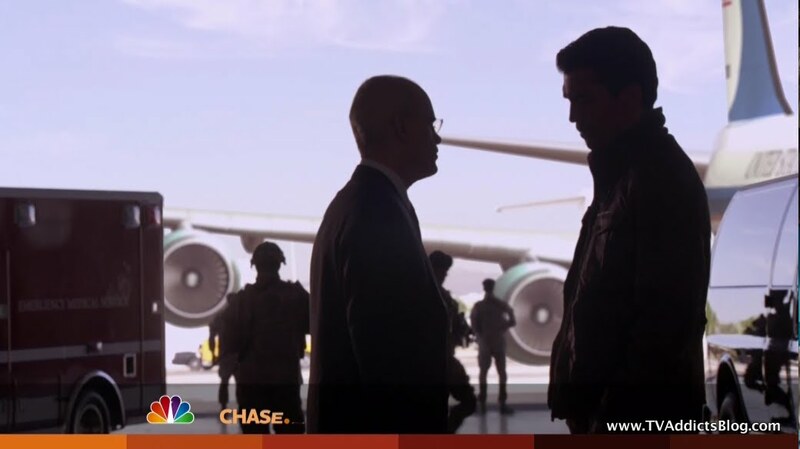 Before Eli has a chance to talk to Sophia about her shady statement, the Secret Service rushes the President AND Sophia to separate vehicles. The president resumes the same exact position hovered over his wife and child. (I mean seriously. Couldn't you have filmed one more take of that to make it look SOMEWHAT different than the 2 times we saw it in the Pilot episode?) The Prez is taken to a hanger near where Air Force One is parked. And then he gets the lowdown. Oh look, it's Sterling. Even though he was supposed to be at the press conference, he and the Vice President mysteriously vanished. But there he is giving Eli the full scoop of what went down. He knew all about the pilot Michael Buchanan who hijacked the plane. You name it! The President does not care about the attempt on his life. He wants to know what saved them, where the plane went, you name it. And there are analysts on hand to explain some of it. Oh get this...there was an "electro-magnetic event"....... you want me to say it...........you know I'm going to....... OOOOOK, Do you think this coincides to when Desmond turned the failsafe key and blew the hatch to kingdom-come and turned himself into a time traveling, constant desiring, walking with the dead enigma!? Okay, I'm sorry! I just can't help myself. But seriously? Another Electro-magnetic show? Well, this explains why the equipment was all malfunctioning right before the plane disappeared. On a little buggy ride to another detention center, Eli and Sterling discuss how there must be OTHERS outside of the 97 detainees, living out in plain sight. They have infiltrated the world! Hmmm, advanced beings that look like humans with an evil agenda? This sounds really familiar. Did we land on Caprica during the 2nd Cylon war or something? Or are these people really lizard-like creatures with human skin? Pick your favorite show! Hey, it's a tried and true storytelling device and as long as they have a bit of a twist, it could be just as interesting! We see a WWII fighter plane flying over a wreckage. And then we join Sophia who looks exactly as she does in the present day as she tends to the wounded. She spots the plane and then calls over to a man she calls Thomas. Sophia orders Thomas to take the able bodies and move on. She can't risk them all being caught. There will be no hope for them. Thomas wants to fight. She will not allow it. It's all very vague what their intentions are. I'm sure we will learn soon enough! President Eli comes to confront Sophia. He isn't as pleasant with her as he has been in the past. He wants to know why he has been deceived by her. Sophia tells Eli that they mean him no harm, her people saved his life. She refused to tell him how many people were living amongst them, where the plane is. She could simply not know, but considering how she hasn't been giving up much information, one would think that she knows SOMETHING. Eli wants the truth and is going to send her back to Inostranka where she and her people will stay until he gets it. Sophia insists that "the truth" is that her people are getting very tired of being detained. After 66 years their patience is running out. Hmm, so are they REALLY being detained or just "pretending" to be in captivity when they are capable of so much more? All very vague for now! Sophia does seem to be sincerely trying to reason with the President. I guess we'll see how sincere she really is! We learn more about Leila's kidnapping. Leila and Sean have a nice moment in their room before Vicki came to take him away. It looks like Leila is the one that pushed him to go with her. Very very bizarre! Then again, we do learn in this episode how much Sean loves to go snorkeling as well as his love for swimming. So once Vicki is gone we see Greg "Vicky's Boyfriend" show up. We just assume he's going to kidnap her. Instead we see him offering her some meds to settle her stomach. We think he is going to poison her. Then we see Greg feeling up her leg. She kicks him out and security is right outside the door. Oh no but it's not security, this guy takes a knife and shoves it right into Greg's chest. WHAAAT!? Oh and that's not all. You remember the security guard who Sean was talking to about his room key not working? He was in on it too! They inject Leila with something that knocks her out and take her away. So what does this mean for Greg? Was he not involved in the plot? I'm not so sure yet. Are these security people and Vicki all part of this group of SUPERHUMANS? We see Michael's captors explaining to him how he HAS to fly this plane. They let him look through a peep hole where we see Vicky holding a gun to Leila's head. And they apparently have Samantha too. We also confirm that the mother is dead as well. So, there's your motivation for him flying the plane into the President! We learn how Sean and Leila first met. He was swimming laps in a pool at college. She was unable to swim but in there anyway trying. Sean starts working his mojo and trying to teach her how to float on her back and then offers to give her more lessons in the future. We also learn that Sean is in some dorky Computer Science club. It hasn't been revealed to us on the show yet but he is a video game programmer according to his bio on the official site. RIGHT, you thought I forgot about this, right? Where did that plane go? Well, it came out of a blue light all the way on the other side of the country in the desert! 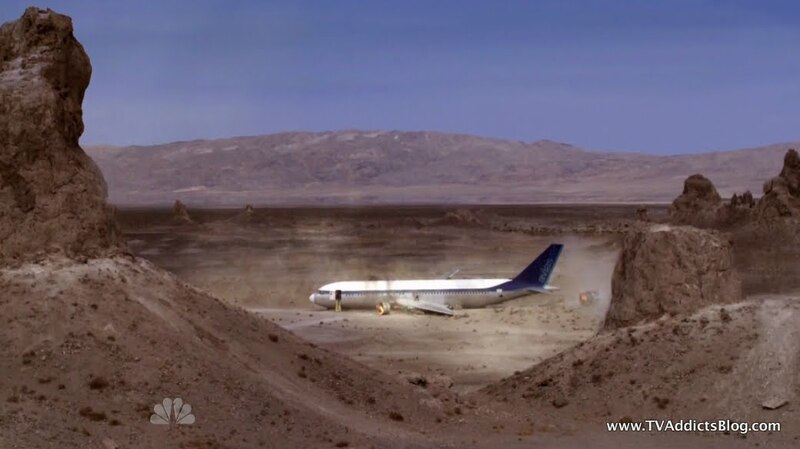 Now, I'm not sure if the electromagnetic event caused the plane's systems to fail which led to it crash landing or if this was Michael's attempt to land the plane but it came down hard! Not hard enough to blow up on the spot though! The Air Marshal and Sean were called into action evacuating everyone off of the plane due to a fire starting. Michael finally gets off of the plane and catches Sean up on what is going on. There's a girl named Vicki that had a gun to Leila's head. They killed his wife. He had to do it. etc... But there is still hope. We see a bunch of helicopters coming towards them. Michael tells Sean to GO and warn people. My first thought...umm he's in the middle of the desert! How is he going to make it anywhere?! But we see Sean sprinting through the desert. We don't know how far he made it before he collapsed, but we do know that he collapsed! He tries to tell the nurse everything that has happened but she doesn't believe him. Who would? But he needs to talk to the police about his girlfriend being kidnapped in Antigua. The nurse calls the police just so he could get him to shut up. Of course, the police are looking for a Sean Walker for the murder of Greg! Man, they set this guy up really good. Sean eventually catches on to the nervous nurse and makes a run for it. But unfortunately, it's too late and he is caught. 2 Cops are escorting him to the police station as he tries to explain the gravity of the situation. They arrive at a roadblock and Sean recognizes the area as where the plane crashed. The cop at the roadblock sends them back on a detour that will take them 2 hours out of their way. Sean tries to urge his captors to drive through the roadblock so they can see the plane, but they refuse. They clearly think he's crazy. But the woman in the passenger seat seems like she was beginning to believe Sean when he started talking about Leila and how he was going to propose. Stay tuned for next week on this one! So this one seemed the most obvious to me. Long story short, it turns out that Simon is one of these people living amongst our people. We had seen him meeting with Sophia in the pilot episode discussing how William wants to tell people about The Event. And now we see him using getting a blood test to join the CIA but his blood is not even his own. How many people cringed at him pulling the tube out of his skin?! Sterling puts Simon in charge of a task force to hunt down these OTHERS (sorry, just don't know what to call them!) and find out their abilities, agenda, etc.... He wants them ALL! What will Simon do!? Well, he'll have to work his cover! But, he does go pay a certain someone a visit first. Well if it isn't Thomas, the man Sophia sent away 66 years ago! Thomas calls Simon, "Brother" but it's tough to determine if this is just a greeting of 2 like beings or if they are related to each other! Thomas is not happy with the turn of events. With the decision to "save the plane". He wanted the jets to shoot down the plane. It may have kept the deal on the table to free Sophia and the detainees. Simon and Sophia weren't willing to lose the 200 people on the plane. It would appear that there are different factions within this group. Good and Evil? Well maybe...but for now it would just seem that they are willing to go to different extremes for the same goal. Simon wants to know why no one has heard from the plane or the passengers. Thomas decided since he had them he may as well use them. He provides the coordinates in Arizona to the plane and sent Simon on his way. Simon gets to to Arizona with his crew. 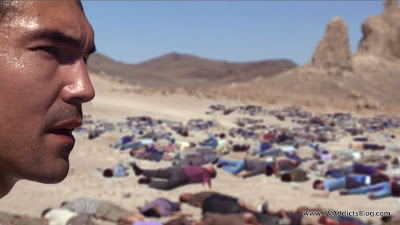 They find Michael Buchanan dead and then over a hill they find all 200 passengers of Flight 514 killed. All passengers minus one. WHAAAT!?!? They killed all of the passengers anyway? WHY? Why on earth would they need to do that? Clearly, there are 2 factions of these mysterious people whatever they are. Where is this story going? It's anyone's guess. But it definitely is one thrill of a ride and I'm enjoying it! I'd love to hear your comments on what you think, yes, even if it's that they're all aliens! I'll be here next Monday recapping once again so come on back! Hope you enjoyed my ramblings and I'll see you next week! Find my EVENT posts also at http://www.thetvevent.com. If you're looking for more information on The Event, this site is a great source to check out. I also have worked out a deal to share my recaps over there as well. So read wherever you like! Keep checking back for posts on other shows. I will be recapping Fringe this season as well as keeping up with other shows I enjoy from time to time. I look forward to great discussions with everyone! Thanks Mark! Please disagree with me! I'm merely throwing suggestions and building upon suggestions that other commenters have made. Actually, I never watched The 4400 and didn't realize Nick Wauters was attached to that show as well. So that show was about people from the future and not aliens!? lol shows how much I know. I guess, though, it's hard not to borrow from sci-fi predecessors when entering the same genre. So, like I said in the recap, even if it is something we've seen before....as long as there is some kind of twist on the concept, we might be on board for it! Thanks for the comment and the props! Thanks again for your great recap. The OTHERS--you gotta luv it. With MNF and 2 1/2 men competing with this show I am switching a lot. I don't Tivo or record, since time is hard to come by on any day. So, your recap makes it possible for me to really follow the show. Honestly, if you didn't do your recap, I might not watch the show. Interesting that NBC had the pilot on several of their other cable channels last night. 1, We did get a few answers, such as where and how the plane moved. It didn't time travel, apparently. When Michael saw the helicopters he immediately thought they were associated with the others, not military or police--I find that very interesting. He obviously beleives the others to have significant resources as they also demonstrated by the kidnapping and cover up of Leila. 2. Several things don't make sense though, for example, how can all of those helicopters come in to the crash zone without detection. 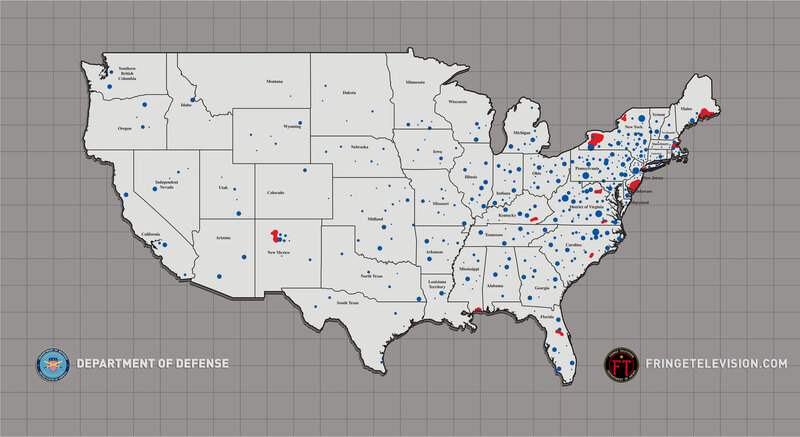 Unless the others can build special helicopters or they have developed some sort of cloaking device, the ATC, DOD or CIA would have spotted that large of a grouping. 3.Unless they didn't fly for very long. Which means their base was nearby. Helicopters don't have that much range anyway. (BTW, I hope this show will allow us to use real world scenarios to help with deduction). 4. In the last 66 years I wonder if the others have multiplied in number so that they represent a sizeable number of people in key positions? 5. Vicki threatening Leila--that one was obvious. But Greg being stabbed by the others, I didn't see that one coming. 6. Was the local cop there to block off the road for the others or for the DOD/Gov? Maybe both as a double agent type? @Richard - No problem! I do it for myself just as much as I do for everyone else. I love the discussions and I hope they continue to grow like they did on the LOST blog. (Well, maybe a little less crazy than the LOST blog got lol) I appreciate the props on the recap. And I have heard good things about 2 1/2 Men so I won't hold it against you! :-) j/k lol I commented on the Fringe recap about NBC airing the pilot on so many channels. They have beefed up the marketing instead of slowing it down after a successful pilot. Very good strategy. The show needs lots of eyeballs continuously if it wants to avoid a FlashForward fate of slow decline in viewership over the season. I like it! 1.) Yeah the guy that held Michael captive (apparently the same guy as the security guard that killed Greg) said something like "You know what we're capable of" ....so Michael may have witnessed a few things we have yet to see. I think even though these people have died...we may be seeing lots of more of them via flashbacks. (a la LOST) Very interesting indeed on the observation. 2.) Ahhh a little question of LOGIC to add to the mix! Nice. I have no idea how they could pull this off...and maybe you're right. Maybe they're "special" helicopters. 3.) Real world scenarios would be fantastic. Good point with the choppers. Very good observations! I'm always just caught up in the moment and theorization I don't think about how realistic it is. Of course, I think 24 has dumbed down my desire for shows like this to be realistic as well lol You know...a show where cell phones from 5 years ago can do anything under the sun! 4.) So you're suggesting maybe the OTHERS have reproduced? Or more have arrived? Very nice! I like it. 5.) Nope...I didn't see it either. It was a nice twist. But I'm not ruling out Greg being involved just yet. 6.) Yeah I was thinking the Roadblock Cop might be one of the OTHERS too. I'm on a conference call right now...but I'll add more to this when I get off of it. I just wanted to post this while I had it typed out! Thanks for your comments and thoughts! Okay, so building on my "these are evolved humans from a very distant future" theory. They could have traveled back to 1944 in some grand scheme to prevent an EVENT that happened in THEIR timeline. I was listening to a podcast this morning where some suggested that there could be ANOTHER faction of others coming back from the future to make sure the EVENT DOES happen. I first thought "they" were the passengers from the plane, transported though time and altered. Wrong. My first theory blown. When Sofia had her little chat with Simon in the pilot they talked about Thomas being out there and not caught. I had the impression that he had escaped from the facility, not that he was in hiding all the time. 66 years is a long time to be undercover. Theory #2 wrong. Greg getting stabbed? Didn't see that one coming. The security guard was in on it? Didn't see that coming, but the other one, the one that stabbed Greg....Krycek. Any show with Alex Krycek from the X-files, you know he is going to be a bad guy! I was suprized that all the passangers were killed, did they go through their pockets looking for the blueprints to Jacobs cabin? Wait, no. I am liking the show, just haven't gotten a chance to warm to any of the characters yet. Thanks for a great recap! @Jennifer - That was a pretty decent theory with them being the passengers but yeah it's not looking like it now :-) I thought they were talking about a WILLIAM in the pilot. Are you sure it was Thomas? I totally didn't see Greg being stabbed or the other guard being in on it. Yeah Stabbing guard did look shady right from when he answered the door. I was an on and off X-Files watcher so I'm not sure if I remember Krycek too well :-( But that's cool that they recruited him for this show! I think the only character they're making it easy to root for right now is Sean Walker. I'm totally invested in his story. Everyone else just seems like they are involved in providing us a big brain dump of information. GOOD information, but still a brain dump! No problem on the recap. Thanks for reading and commenting! Thought it was amusing when the Pres asks 'so why are we holding them?' I think Greg was involved. Him and DB Sweeney were sorta arguing who was in charge, they just decided he was expendable. It's starting to feel like a group or faction, either private or military/gov't planned the attack on the pres so that they could force the aliens out into the light. I'm not so sure that the aliens killed all those aboard either. Sophia is clearly in charge and did not want the passengers killed so the plane was saved - so it would make no sense to kill everyone then. Maybe our gov't did in order to keep the aliens a secret. I'm thinking Michael never put the landing gear down since he never did plan on landing. By the time they came out in Az it was too late. The security guard was DB Sweeney - and I don't remember him being Krychek. My recollection of 4400 was that humans were taken from earth for years - then returned. So some were gone for 40 years, some 5 years, some 6 months, etc etc And when they came back the had abilities. But they weren't alien to begin with. Yeah, my wife recognized the security guard as DB Sweeney too. I'm in the dark and do not know where I know him from! lol But I'll check IMDB when I have time. I think I agree with you about Greg still being involved. I got the same vibe from the conversation. Ahhhhh don't say Aliens!!! lol But I get the idea and that sounds about right. It's possible that the gov't killed them. But then why would Thomas say "since we have them I figured we could use them" ....or something like that? I still think the VP and Sterling are shady so it's possible they ordered them all to be killed. Good call on Michael and the landing gear. And very interesting on 4400...not sure why I never watched that one! Anyway...just heard the ratings took a big hit this week. Oh boy ...here we go again. Mike, I really like your theory that the event is some FUTURE event that the time travelers are trying to prevent - it could be whatever caused their DNA to mutate to be 1% different from ours (or maybe not - the DNA difference is probably why they age slowly or not at all). I think it's a cool concept even if it's been used before. Is it possible that the attack on the Pres was caused by a third faction - neither the imprisoned or the hidden ones? It's possible the goals of the two factions of the Others have diverged during the 66 years of imprisonment, but does it make sense for them to stage an attack and then stop it at the last minute if they didn't want to be discovered? Simon seemed to be in on it, though, since he said "If you're going to stop it, you better do it soon" in the pilot. BTW, Simon's false vein really made me cringe, and I have a very strong stomach! I'm really feeling sorry for Sean - poor guy! How much more can he take?! But the female cop did have a good point - what makes him so special that they would go out of their way to lure him off the boat - why not just kill him and kidnap Leila? I guess it's a screenwriters device - there has to be someone for us to identify with and be our surrogate in uncovering the "truth". Or, what would be better, Sean could turn out to be key to preventing the occurance of the future Event. So there are 2 groups of others. The captured others (CO) and the amongst us others (AUO). I don’t think the AUO was the group behind the attempt on the president, kidnapping and killing of the wife . It has to be another secret group that knows the AUO exists and does not want the public to know (maybe HEROES hunter and VP is leading this group). It doesn’t make sense to me that the AUO would go through all that effort to kill the prez and also save him at the same time? I think the cop that was blocking the road was part of this secret org. Faction 1: Thomas’ faction: leader of the “hidden in plain sight” aliens. He is clearly the one who is “tired of his people being detained.” It is unknown if he shares an agenda with Sophia, most likely in purpose but not in action taken to achieve it. The fact that he was so prepared to fight for survival dealing with the crash (kudos to the show for NOT crashing the craft in Roswell in 1962 like usual btw) leads me to believe that they “came all this way lookin to start a fight”..why did the ship crash? It isn’t known if he was part of the faction that “saved the plane” but it certainly seems that way. Clearly Sophia was the target of the assassination, but why did she seem shocked that they were saved? It seemed that she was part of the faction that set it all up from moment one, even if she didn’t want so much human blood on her hands, but why would she even care? 2. If we assume they meant to come to Earth, why 1944? It would stand to reason that the events surrounding WWII led to all the significant technological advances in the world from that point forward. We may discover that ultimately this crash led to the Manhattan Project in some way. Which begs the question, why have we learned nothing from them? Maybe this will be discovered later but the previews seemed to imply that NOW we are finally going to get one of them to talk? Like what has the government been doing this whole time? Say what you want, but where are the Autopsies, where is the new technology? It certainly SEEMS like we are not getting any from them overall, since “they” have an EMP weapon and the government doesn’t. Overall the show makes the US Government/Military look just as incompetent as in Independence Day. Faction 4: Any “aliens” that are against the “aliens” we know. This could be where the ship crashed from, a rival faction wherever (whenever?) they come from. Should be enough for now….hope this brings some discussion! @David - Glad you like the theory! Can't take all the credit myself for that one as I have just heard/read people talking. Anything is possible, so a 3rd faction wouldn't surprise me! It definitely is possible that a 3rd group is behind the attacks and the kidnappings. I love how you guys are going right along with calling them OTHERS. Doesn't it make you feel a little dirty? Like you're cheating on LOST or something? lol I gotta put a stop to it!! Yeah that vein was rough stuff! @Heri - All great thoughts! So you and David seem to be in a similar boat that there are 3 groups at play here. Definitely possible! @AuStarWars - Woa....that is some crazy analysis right there! I'm going to have to revisit that later but I'm liking where you're going with it even if I don't want it to be aliens lol So crazy that after all this time, I didn't know that is what the X-Files turned to be about! That's what happens when you don't watch all of it I guess! "The Event, which was down 19% versus last week among adults 18-49. It averaged 8.9 million, down from last week’s 11.13 million." I had the same thoughts as someone above regarding Thomas' statement that he wanted to "use" these people since he had them. I guess that could mean kill them all but I'm assuming he and his group did something else to them and perhaps they're not exactly dead. Not sure what that could be... but with their advanced technology, maybe they just appear to be dead. "The security guard was in on it? Didn't see that coming, but the other one, the one that stabbed Greg....Krycek. Any show with Alex Krycek from the X-files, you know he is going to be a bad guy!" No not good at all Stedman. I saw it earlier too. But then again, things could be worse. Lonestar was cancelled after 2 episodes today! AUStarwars - Ironically, Juliet's actual ex-husband from LOST is on The Event! lol Seriously...i'll get to your posts later...there was a lot there! Thanks Mike for writing this blog and for the Lost references... brings me back to the good old days of LostAddictsBlog. Keep up the good work. SPOILER: I read that 'one of the narratives we have been told is a big fat LIE'. DB Sweeney/security guard has been in so many things. 24, Jericho, etc etc. Okay @AUStarwars - I promised I'd come back! I think your stuff speaks for itself so I may still not add much to it. But I like the comparisons to the X-Files and how they could still make this show interesting and different even WITH the Aliens concept. I do think the point about Sophia being the target of the assassination is really interesting. That seems like a viable twist....these people really wouldn't care about getting the Presidnt out of commission but may see Sophia as more of a threat to their goals. And yes, it does raise the question of why she would be shocked that she was saved. But based on Lincoln and Thomas's confirmation it would seem some of their people have differing opinions on things. Very interesting idea that these people may have been influencing technology since their crash in 1944. Very interesting indeed. That would be cool if they linked it to the Manhattan Project. As for #3, I agree we are going to find out some of these people are in positions of power. That's kinda why I related it to BSG....(and I guess V too)....we just don't know who among us are these people and it will lead to some interesting twists. As for Faction 2...all sounds good...and I'm with you on the presential comparisons to real life. Of course, I'm sure Martinez's approval ratings will only go up. We have to face it...no one will ever be a greater president than President Palmer! Faction 3: I think the only "good guy" hero that we are really supposed to be rooting for right now is Sean Walker. Yeah, the president seems to have the right motives but he could be digging himself a nice hole with pursuing this. We'll see. @Rob - You are totally welcome for the blog and I just can't help myself with the LOST references. With the FlashForward blog I tried to throw in at least 1 per recap. And thanks for the props! @MJ - I looked up D.B. Sweeney and I've watched every episode of 24...it looks like he was in the final season and I just can't remember him! lol Oh well...I'm sure I've seen him in tons of stuff. Never watched Jericho though. I agree that all shows take a hit in the 2nd week. I, too, hope that it maintains its audience and totally agree that the DVR+7 numbers and probably iTunes, Amazon and whatever else downloads will be big for this show. And I'm sure international audiences are going to be really into this show as well. So, there's lots of hope outside just the monday night ratings! We'll see. Definitely intriguing on the SPOILER comment. hmmmmmm I'll have to think about that. What if the Michael Buchanan wasnt trying to kill the president, but was trying to kill Sophia? Just another angle to look at this from. @T-Bone welcome to the comments! ironically, AUStarWars and I were just discussing this idea above. I like the possible twist of Sophia being the target rather than Martinez. Definitely make sense. Time will tell! i don't know if it's because the past few days have been an emotional roller coaster for me, but i'm not totally getting into this show. the only characters i actually care about are sean and leila. the constant "13 months ago/4 days ago" is annoying to me. yes, i know, Lost did flashbacks.. but Lost did it first and the flashbacks followed particular plot lines and didn't jump around like that. i'm going to give it another couple weeks, but they need to develop these characters more or i'm going to lose interest. Just read that Josh Holloway has signed on with JJ for MI-4. Also - Bernard popped up on NCIS last night. @Kelly - I hear ya. The show won't be for everyone and NBC is definitely marketing it as THE NEXT LOST which could drive some people away. I wouldn't say LOST was the first show to ever do Flashbacks. But the show became very famous for utilizing the tool and they did it on a character by character basis. The Event is trying a different method by showing us LOTS of characters and jumbling up the story time-wise. I think this IS their attempt at developing the characters. All I can say is...even LOST needed time for us to get to know these characters. Every show is telling a story and it's going to take time to unfold everything. It has only been 2 episodes of The Event...that is equivalent to 2 hours of the LOST Pilot...we had a mini-Jack flashback from the plane, a Charlie flashback from the plane where we learned about the heroin...and a Kate flashback on the plane...where we found out she was in cuffs. Not much diving into their past and learning all about them. All the characters were just meeting each other. Clearly, the Event is not showing all of the characters meeting each other....it's a totally different story we're following. But I'm digging it for now. But I appreciate you watching for the recaps! hopefully the show will grab you eventually! lol oops i didn't mean to say that lost did it FIRST... i meant more along the lines of Lost did it before the Event, haha..
@Kelly - I knew what you meant so you can just blame me for being so nitpicky! :-) lol Yeah, there is no way I'm about to dubb this show as "the next" or "as great a show as" LOST. All I can say for now is that I'm entertained and am enjoying discussing some of the theories going around. The show has a lot of potential so I'm being as invested as I can. But I definitely hope that something will happen that will really make us all sink our teeth into this show. It never really happened with FlashForward even though some of us pretended it did lol Even IF The Event becomes a successful show and gets us all obsessed one day.....it still won't be LOST. I think we all know that! I don't think the awesomeness that LOST brought us over 6 years can ever be duplicated. But that doesn't mean there can't be room for more high quality TV programming! Honestly, I don't think I was much more interested in Lost after 2 episodes than I am in The Event. For me I know I really enjoy a show when after a 2nd season premiere, I think "How did I live without this for 7-8 months?" Speaking of living without something for the next 7-8 months... does any one else here watch Warehouse 13? It's probably my favorite show on television since Lost ended and I can't find anywhere to discuss it online. Hoping for a renewal announcement soon. Btw, enjoyed the No Ordinary Family premiere, less corny than expected. I'm sure Mike will post something about it soon so I'll wait to discuss further on that thread. @Bryan - That sounds absolutely like me too. I loved the LOCKE reveal in season 1....after Claire and Charlie got kidnapped...I was hooked. And I wouldn't miss an episode. But then when season 2 premiered...and it was time for watercooler talk and crazy observations again.....I remember being really busy at work and being so annoyed that I was missing all of the post episode discussion. I'd start emailing my thoughts to people and then 7 episodes in...I created the LOST Addicts Blog! lol It really didn't hit me until season 2 how obsessed with LOST I was. Definitely takes time to become obsessed with a show! Sorry Bryan...i've never seen Warehouse 13...but I think some people that read this blog do. Maybe I'll have to check it out! I'm wrong again, DB Sweeny, not Krycek...he looked familiar, time muddles the brain. Thanks for correcting me. I have really been off the mark on my thoughts on The Event! "Thx everyone for all your support, messages/feedback. I promise you we delve deeper into each character in upcoming episodes." I know some were looking for caring about the characters more....so, apparently it's coming! We'll see how they do. Hey Bryan - I also love Warehouse 13 ! Was a good season this year. I'm sure they'll be back. Knew that HG was gonna go bad of course, but it was fun. Have No Ordinary Family on my DVR but haven't sampled it yet. Is No Ordinary Family the one where Jessica Alba plays the girl who can turn invisible and the main bad guy is from Nip/Tuck? How could you not add "and Michael Chiklis" is in it??? lol That is the biggest layup ever! sometimes the obvious..is just too obvious lol...subtle humor..
@MJ - Yep, but she makes an awesome villain! I hope she sticks around. @AUStarwars - fine, I will concede! FRINGE was fantastic as expected tonight. Gotta start working on that recap. I still am not sure how long I can stick to "RECAPS" per say on Fringe. There really isn't much to recap. Just kind of OBSERVATIONS and stuff!